Welcome to Overseas Nest, Calicut's leading Budget Men's Hostel, catering to the needs of the corporate employees. The hostel is located in the Downtown of the city and is at walking distance from major commercial & business, entertainment and shopping centres. 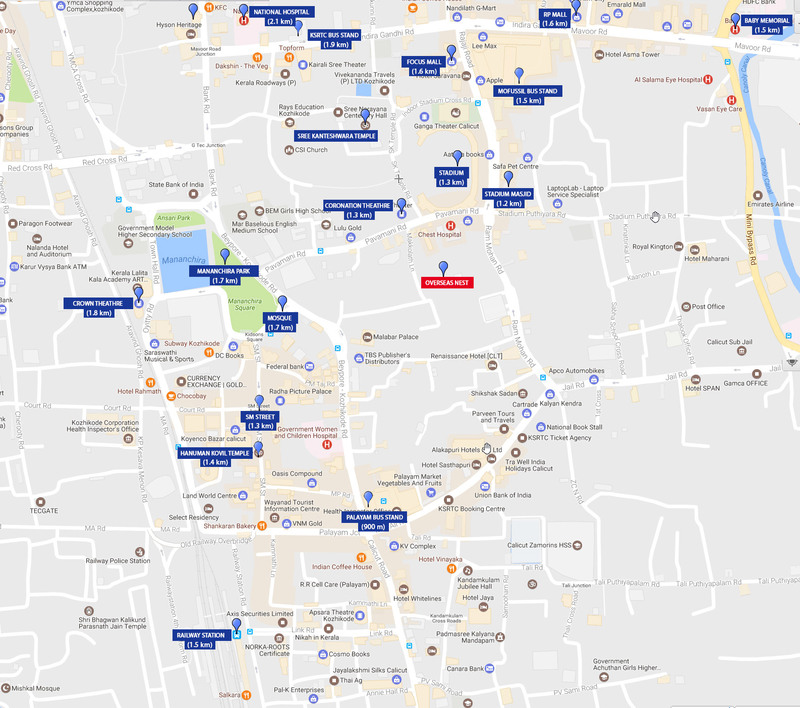 Walkable distance from KSRTC, Palayam, Private Bustands. We provide AC and Non AC great looking executive single occupancy furnished rooms with attached bathroom. Ample parking available for both cars and bikes. You can park your vehicle safe in the hostel. 24 Hour Security focused on providing the best quality security services with the highest levels of customer satisfaction. Clean and serene ambience with efficient and dedicated staff to perform any cleaning duties to maintain the cleanliness. A common reading space is available for all the book lovers. We provide comfortable accommodation facilities with our single occupancy furnished rooms with attached bathrooms. You are sure to receive excellent service and personal attention. With the completion of our new building, we welcome our customers to an ideal place for exploring all that Calicut City has to offer. The most prominent IT Parks in the city like UL Cyber park and Hi-Lite Business Park are situated conveniently close to the hostel. It is also the closest Hostel to the train and bus stations, being only a walk able distance from both. We provide budget accommodation in Calicut without compromising on security, comfort and cleanliness. Both cash and card payments are acceptable. We at Overseas Nest welcome everyone, regardless of the nationality, race, gender, orientations, or beliefs.We welcome you to our haven of peace. Clean, Spacious and Comfortable Men's Hostel in Kozhikode City @ Unbelievable Affordability!